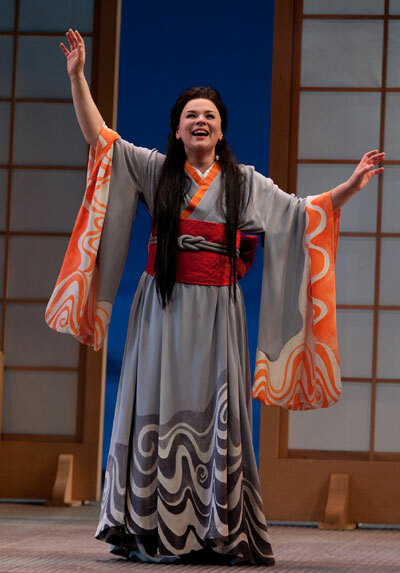 Lithuanian soprano Ausrine Stundyte makes her Seattle Opera debut tonight as Cio-Cio-San in Madama Butterfly, opposite tenor Nathaniel Peake as Pinkerton. Today we get to know Ausrine, who tells us why learning this role converted her into a Butterfly believer. She'll sing Cio-Cio-San two more times after tonight's performance, on our Sunday matinees on May 13 and 20. For ticket and production info, visit our website. You can also hear a clip of Ausrine singing here on her bio. Welcome to Seattle, Ausrine! First off, can you tell us how to pronounce your name? This is your first time visiting Seattle. What do you think of it so far? I’m so excited to be here, and I’m surprised by how nice and helpful people are. And also by how open they are. That’s something that was a very big surprise to me. You can speak with people in the street and after five minutes you know everything about them, and they know everything about you! I’ve never experienced that before. It’s kind of wonderful. 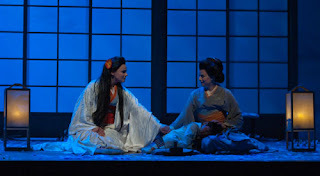 Ausrine Stundyte (Cio-Cio-San) and Sarah Larsen (Suzuki) in Madama Butterfly. Have you spent much time in the U.S. in the past? Not really. I came once before, with a Lithuanian folk music group, when I was still studying singing back home in Lithuania. We went for one month to cities in the United States, but we had concerts every day for Lithuanians in America, so I didn’t have time to see anything. We just went from concert to concert. So this is the first time that I really live here and get a feel for the country and the people. What’s the opera scene like in Lithuania? We are a very small country—all of Lithuania is less than 3 million people—but we do have three opera houses, which for 3 million people is good. But we very many singers so in that sense, it’s not that many. I’ve sung there only one time, actually. I left to finish my studies in Germany and then I stayed in Germany. Now I live in Cologne. 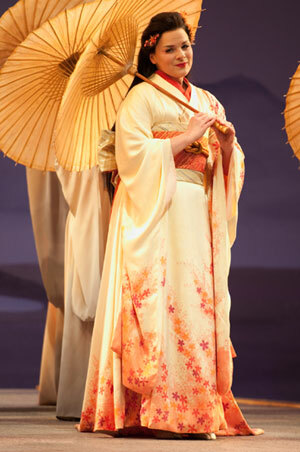 Ausrine Stundyte (Cio-Cio-San) in Madama Butterfly. 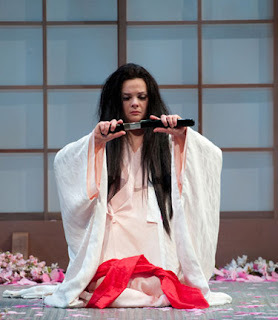 Let’s talk about Madama Butterfly. How many times have you sung the role of Cio-Cio-San? I think maybe five times. What do you think about this opera, and this role? I like it very much, but when I first had to learn it, I thought, “Oh. 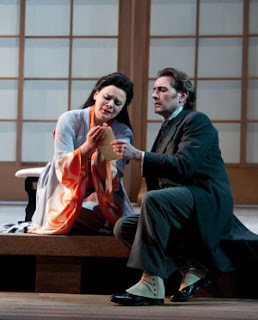 That.” To be honest, when I was in the audience for Butterfly, I found it to be one of Puccini’s most boring operas. So I was not very excited about learning it. Of course, I was happy for the opportunity, but not crazy about it. And then I started to study Madama Butterfly and I was surprised by how wonderfully it’s written, how true it is, and how nothing is cold or kitsch or empty. Everything is so psychological, and the character of Butterfly is nothing like I thought. I always thought she was naïve, like a child, but she actually has such great development. I love that, singing this role, you begin on stage as one person and finish at the end as someone completely different. I think it’s difficult to find another part in opera that is so rich in the changes and colors on stage. Ausrine Stundyte (Cio-Cio-San) and Brett Polegato (Consul Sharpless) in Madama Butterfly. Do you have a favorite moment in Butterfly? —weak. Well, I’m not an expert on the Japanese mentality, but I think that death there has a different meaning than it does in Western culture. I think honor is much more important. And at the end of the opera, Butterfly had nothing left: no hope, no child, nothing. So she could have found a way to survive somehow, but she experienced something so wonderful—because I’m sure she was extremely happy when Pinkerton was living with her—that everything yet to come would have been so much worse. She chose not to have that. I don’t know if that’s weak or not. There is an instinct for life that some people have very strongly; they want to live like crazy, even though they don’t know exactly why. And some others just don’t have that instinct. So I suppose she just made a choice. Do you sing a lot of Puccini? I do. He’s the primary Italian composer I sing. What’s your favorite Puccini role to perform? I love Butterfly, but I also love Manon Lescaut, who is a completely different woman but very interesting and full of life and fire. Which role, from any composer, would you love to sing in the future? Oh, so many. I have so many dreams. I would very much love to one day sing Salome. And Isolde, which is again a completely different world—but why not, someday? From Puccini, I think I’ve sung everything I really wanted to sing. I’m very happy. I’ve already done many dream parts. What’s next for you, after you wrap up Madama Butterfly here in Seattle? I’m going back to Germany and am very excited to sing Kundry in Parsifal. This was a stunning debut for Ausrine as Cio-Cio-San. I look forward to her return engagements with Seattle Opera. This young woman took my breath away. She gave Patrician Racette a run for her moneyy!